Why are adolescent girls prone to depression, eating disorders, addictions and suicide attempts than ever before? Mary Pipher believes adolescence is an especially precarious time for girls, a time when the fearless, outgoing child is replaced by an unhappy and insecure teenager. Her view is that for the most part it is our look-obsessed, media-saturated, 'girl-poisoning' culture - and not parents - which is to blame. Despite the advances of feminism, escalating levels of sexism and violence cause girls to stifle their creative spirit and natural impulses, which, ultimately, destroys their self-esteem. Yet it is often their families that are blamed. Here, for the first time, are thr girls unmuted voices. 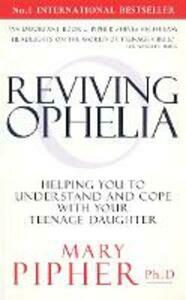 By laying bare their harsh day-to-day reality, Reviving Ophelia offers parents compassion, strength and strategies with which to revive these Ophelias' lost sense of self.